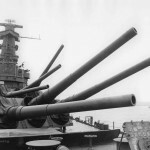 Battleship guns helped win the Second World War. What about the race to the moon? 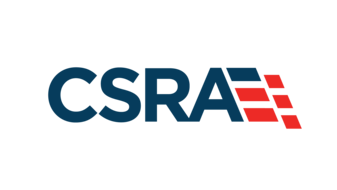 Bob Fish, author and USS Hornet Museum trustee, recently visited NASA’s AMES Research Center in Sunnyvale, CA, to investigate the possibility of cooperation and collaboration of STEM-related programming. While there, Bob visited the Hypervelocity Flight Test Facility with their engineers.He was then guided into the original 1960’s era hyper-velocity test lab which consisted of an old projectile acceleration tube that is now rarely used. To his surprise, Bob noticed the inscription on the breach of the barrel read “US Navy.” It was in fact a Mark 6 16-inch battleship gun! The connection between battleship guns and NASA research is over a half-century old. The Hypervelocity Free-Flight Facilities (HFFF) inside the ballistic range complex at NASA-Ames is the only aero-ballistic range in North American with a controlled environment test section. 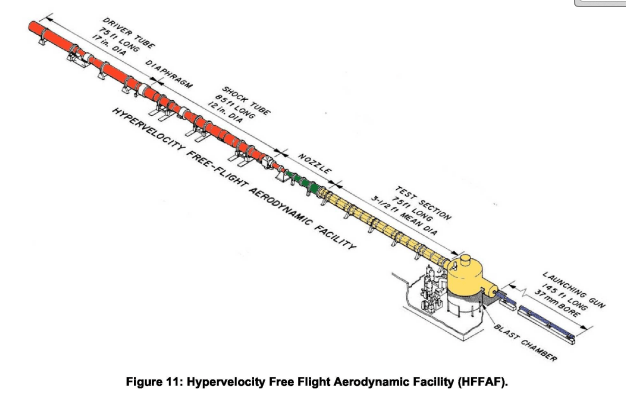 Along with the Electric Arc Shock Tube (EAST) facility, the Hypervelocity Free-Flight Aerodynamics Facility (HFFAF) has been in operation since the 1960s, at the height of the space race. According to NASA’s official report of the facility, the HFFAF has “world-unique capabilities that enable experimental studies of real-gas aerothermal, gas dynamic, and kinetic phenomena of atmospheric entry.” Put in simpler terms, the facilities helps NASA scientist study the nature of entry, descent, and landing systems during the dangerous return trip to earth from human and robotic space exploration missions. NASA defines the HFFAF as an “aeroballistic range” that supports a variety of aerodynamic and aerothermodynamic tests. According to NASA, the complex began operations in 1964 in support of the Apollo program. Even in NASA’s infancy, the necessity for space exploration sped up the development of test facilities that could duplicate the extreme velocities and temperatures from superorbital Earth atmospheric re-entry and entry into planetary atmospheres. HFFAF is a product of this innovation. Small-scale models representing a space shuttle in return entry were launched inside the HFFAF at velocities ranging from 100 m/s to 8,000 m/s. Nearly any type of planetary atmosphere could be simulated. Sixteen shadowgraph-imaging stations were installed in the test section to study the nature of the projectile’s velocity in flight. 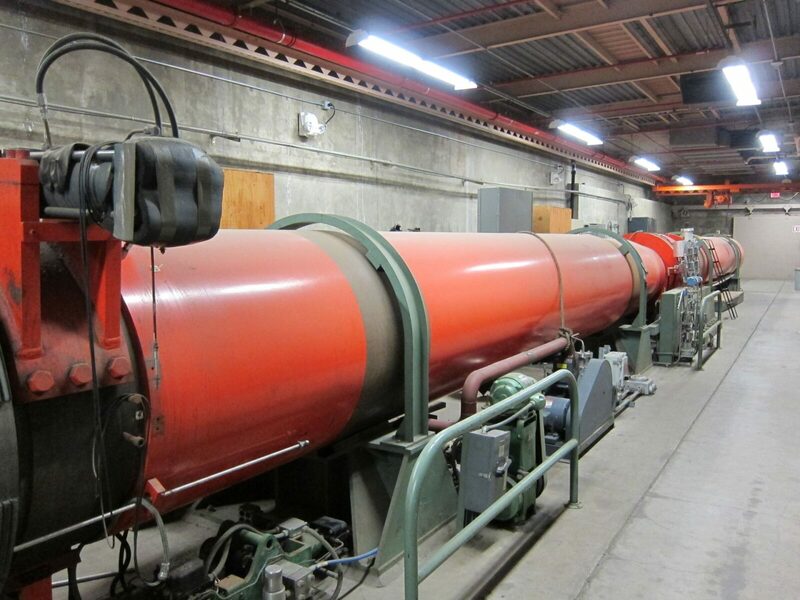 When higher velocities up to 12,0000 m/s were tested at AMES, the HFFAF was connected to a 16-inch combustion-powered shock tunnel, like the one you see above. The tunnels generated up to 4,000 m/s counter-flow in the test section. As of today, the tube is in “stand-by” mode and is not operational. A more modernized accelerator with portholes for viewing is used today. NASA continues to do ballistic modeling of aircraft shapes and space vehicles. The gun itself is a 16 inch-45 caliber Mark 6 barrel. 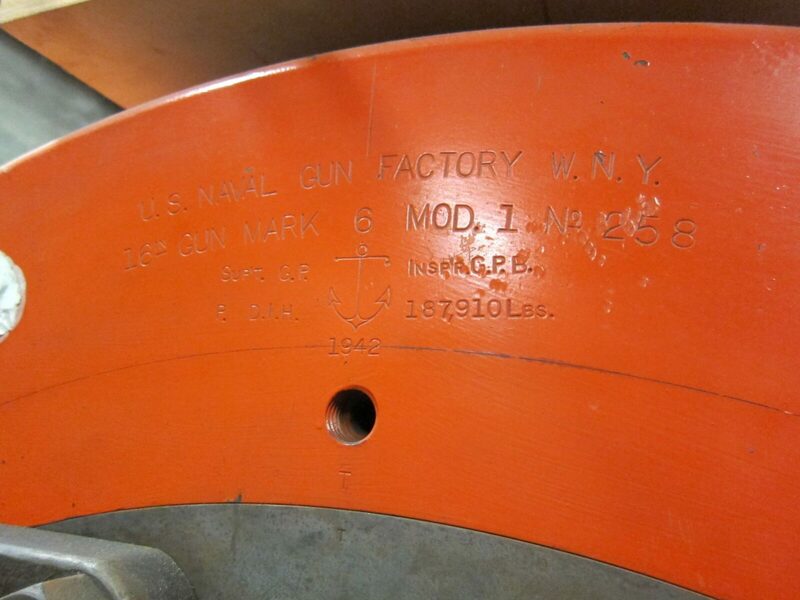 The barrel shown in the above image was made in 1942 here at the Washington Navy Yard. 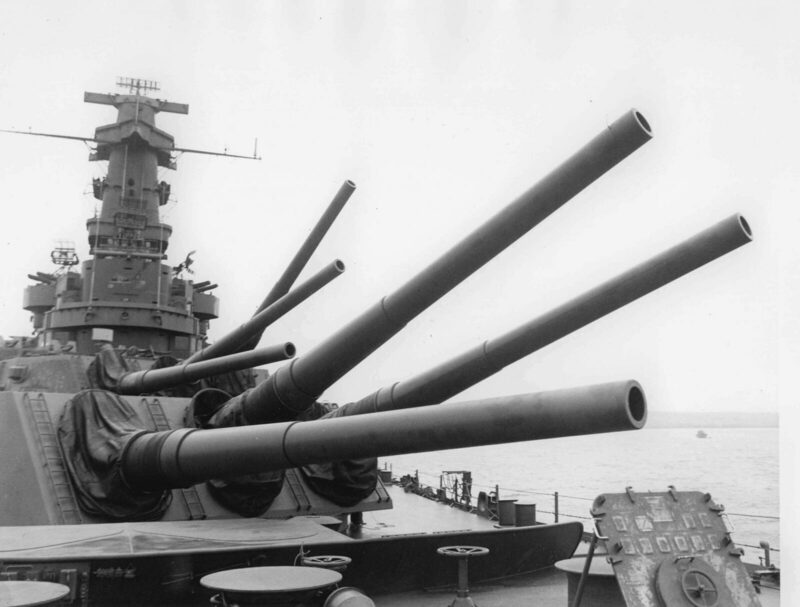 Most 16”/45 guns were used on North Carolina-class and South Dakota-class battleships. The 16 inch-50 caliber Mark 7 guns used on Iowa-class battleships soon became the successor to the Mark 6. Unlike the Mark 6, the 16”/50 gun’s heavier weight and larger size did not have to alight with Treaty restrictions. 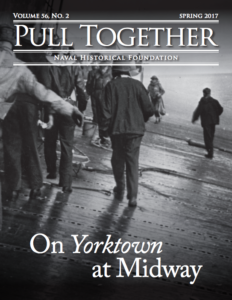 Who knew that the U.S. Navy did much more than supply astronauts and recovery ships. Special thanks to Bob Fish who gave us the information and images for the story. We look forward to hearing more about the aerospace-related STEM programs at the Hornet Museum and its utilization of the technology the Hornet education group saw at NASA-Ames!